Detailed review of Dr. Brandt Microdermabrasion Skin Exfoliant. See how it stacks up against other exfoliators! I am a huge fan of Dr. Brandt’s Microdermabrasion Skin Exfoliant! It’s a bit harsher than other exfoliators but delivers great results. Overall, I ended up giving this product 4 out of 5 stars… but probably would have ranked it higher if it was less expensive. I really like the texture of Dr. Brandt Microdermabrasion Skin Exfoliant. The product itself is very light for an exfoliator. The pharmaceutical grade crystals are extremely fine. I would say they’re about the size of beach sand. These crystals give the product a slightly grainy texture. Dr. Brandt’s Microdermabrasion Skin Exfoliant has a very strong lemon scent. Citrus scents are one of my favorites so I loved the smell. However, it’s pretty strong (and smells a little like Pledge) so those of you who do not like citrus might find it a bit overwhelming. The application process is very simple thanks in part to the tube it comes in. You can apply it morning or night with warm water, massaging it into your skin for 1-2 minutes. Because this is a harsher exfoliator they recommend using it 1-2 times per week and allowing 3 days in between uses. I didn’t experience any drying or redness after using this product. With that being said, I do have fairly oily skin so it takes an extremely harsh product, usually prescription strength, for me to experience dryness. Because it’s a bit harsh, if you have dry skin I would use lighter pressure when applying this exfoliator and make sure to moisturize afterwards. After using this product my skin felt extremely soft. I noticed that areas of dead skin I had prior to use were gone. This exfoliator uses aluminum oxide as its main exfoliation agent. These pharmaceutical grade crystals are included to polish and remove dead skin cells. This exfoliator also uses lactic acid, which helps remove dead skin cells and soften your skins texture. Aloe Vera and Chamomile are two more ingredients they included to soothe the skin and reduce irritation. 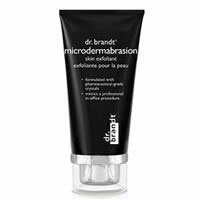 Dr. Brandt Microdermabrasion Skin Exfoliant costs $78, which works out to a whopping $39 per oz! This is definitely one of the more expensive exfoliators on the market. To buy Dr. Brandt Microdermabrasion Skin Exfoliant, click here.